As if Alzheimer’s disease is not scary enough, new reports suggest it can be a contagious, transmissible infection. In a breakthrough experiment, researchers in London show evidence that amyloid – the Alzheimer’s protein – may have been passed on from one person to another. The full details of the experiment are in the journal Nature. Until now, it was thought that Alzheimer’s disease causes were limited to inheriting certain genetic mutations (familial Alzheimer’s disease) or from random ‘sporadic’ events within the brains of elderly people. But the new study proves it can also be contagious. A team of neurologists at University College London, led by Professor John Collinge, analyzed the brains of eight patients who had died of Creutzfeldt-Jakob disease (CJD) – a condition caused by a protein that acts like a virus. Unlike other proteins that remain inert, this protein – called prion – can branch off and sprout new seeds as if it is reproducing. All of these eight people were given growth-hormone injections when they were children. Collinge said that it’s likely they attained a-beta amyloid seeds when they got the hormone from a deceased elderly person who donated the hormone for use as a growth hormone injection. The team believes, in addition to being contaminated with CJD, the growth hormone was also contaminated with a-beta seeds. Not surprisingly, the eight adults, who were between the ages of 36 and 51, all died of CJD. Autopsies on their brains also revealed that seven of the brain tissues had the prions associated with the early stages of Alzheimer’s disease. As Alzheimer’s is generally a disease that affects older people, finding these proteins in this age group was unexpected. 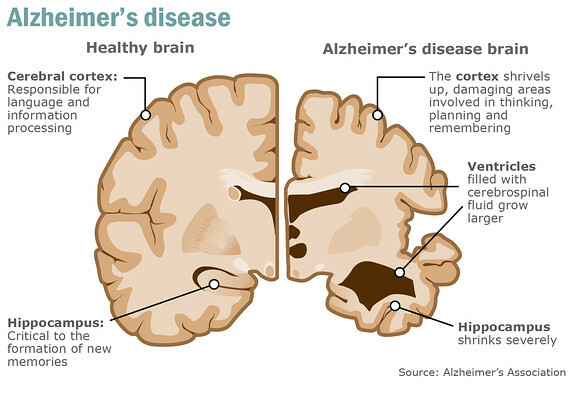 As the scientists did not find the “tau” protein tangles linked to the advanced stages of Alzheimer’s disease it is clear that the seven cases did not have full-blown Alzheimer’s, but there is a good chance they would have developed the condition, had they not died of CJD. While the results are noteworthy, they do not conclusively prove that Alzheimer’s is contagious. In fact, as the sample size of the brains studied is very small, it’s difficult to exactly pin-point the connection between prions and Alzheimer’s disease. What the results do suggest is that we may need to have another look at the possible causes of Alzheimer’s, and how it may develop. From this experiment, we now know that in addition to being caused by genes and environmental exposures, it’s possible that Alzheimer’s may also, in rare cases, be triggered by exposure to amyloid protein ‘seeds’ that may be passed from one ‘infected’ person to another. It’s interesting to note that in laboratory experiments, taking brain tissue from a mouse with Alzheimer’s disease and injecting it into healthy mice has shown that the healthy mice developed Alzheimer’s. According to Collinge, we need to consider that in addition to sporadic Alzheimer’s that comes with age, and inherited or familial Alzheimer’s caused by genes, there could also be an acquired form of Alzheimer’s. He admits that while this experiment does not prove it conclusively, it’s important to do more research to fully understand how vital the amyloid seeds might be in contributing to Alzheimer’s and other degenerative brain diseases.